- While driving off, apply as little throttle as possible. - While driving, ease up on the accelerator pedal. - Adapt your speed and driving style to the prevailing road conditions. Failure to observe these guidelines could cause the vehicle to skid. 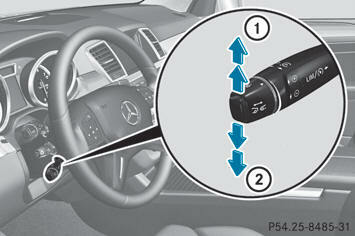 The 4MATIC cannot prevent accidents resulting from excessive speed. Function or performance tests may only be performed on a 2-axle dynamometer. If you wish to operate the vehicle on such a dynamometer, please consult an authorized Mercedes-Benz Center beforehand. You could otherwise damage the drive train or the brake system. Downhill Speed Regulation (DSR) is a convenience system designed to assist the driver during vehicle operation. The system setting must be appropriate to the topographical and weather conditions encountered, which can change quickly. The driver is responsible for the vehicle speed and for safe brake operation at all times. Depending on the programmed speed, actual vehicle speed and gradient, switching on DSR while driving can cause the vehicle to slow down rapidly, and you may hear a sound, caused by the activation of the vehicle's brake system through DSR. Sudden and unexpected deceleration can result in loss of vehicle control, causing an accident and/or serious personal injury to you and others. Do not switch on DSR in a situation where rapid deceleration could result in a loss of vehicle control. DSR controls the set speed when it is active and the automatic transmission is in the D, R or N position. You can drive at a higher or a lower speed than that set on the on-board computer at any time by accelerating or braking. If you depress the accelerator pedal with DSR activated, the vehicle can drive faster than the programmed set speed. You should therefore drive downhill with particular caution as it could lead to an accident and/or serious injury to you or others. Keep in mind that as soon as you remove your foot from the accelerator pedal with DSR switched on, DSR will start regulating the vehicle's speed including use of brakes if required. Depending on the programmed set speed, actual vehicle speed and gradient, DSR can cause the vehicle to slow down rapidly. Sudden and unexpected deceleration can result in loss of vehicle control, causing an accident and/or serious personal injury to you and others. For information on driving off-road. You can only activate DSR if you are driving at 25 mph (40 km/h) or slower. If the driving speed is too fast, the DSR symbol and the Max. Speed 25 mph (Canada: 40 km/h) message appear in the multifunction display. You cannot activate DSR if the SPORT onroad program is activated. The DSR symbol and the Not in Drive Program SPORT message then appear in the multifunction display. The DSR symbol appears in the multifunction display with the Off message. 45 km/h). The DSR symbol appears in the multifunction display with the Off message. Status indicator 3 goes out. You also hear a warning. When DSR is activated, the set speed can be changed to a value between 1 mph and 10 mph (Canada: between 2 km/h and 18 km/h) during the journey. – To increase or decrease the set speed in 1 mph (Canada: 1 km/h) increments: press the cruise control lever to the point of resistance briefly upwards 1 for a higher set speed or briefly downwards 2 for a lower set speed. The set speed appears in multifunction display 4 and is shown in status indicator 3. The set speed also changes in 1 mph (Canada: 1 km/h) increments if you press the control lever beyond the point of resistance.